In order to apprehend the world of movie making that I enjoy, you’ll need to get to know a bit some of the greatest special effects magicians, and more specifically the generation which was born with George Lucas and Steven Spielberg in the mid-seventies. Of course, there were special effects before, such as those of Ray Harryhausen, who was at the top of his art in the 1940’s with Sinbad the Sailor. But in the early seventies, the science fiction genre was considered as dead. It took merely George Lucas visionary genius to push the envelope to an unprecedented level. After completing his feature THX1138, and the American Graffiti, in view of producing his first Star Wars movie, Lucas was able to get seed money from Fox Studios to start his special effects company ILM (Industrial Light & Magic). That’s where all started. He gathered an impressive array of geeks who became the leaders of today’s special effects cinematography. 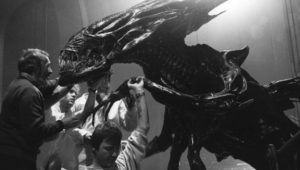 People such as Rick Baker, Stan Winston, Phill Tippet, John Dykstra, Ralph Mc Creery or Dennis Muren were among his key crew. Genius puppeteer Frank Oz would also be involved (he created and animated Yoda), although he was already famous before. Stan Winston was thus responsible for the mechanical effects (aka animatronics) on the Star Wars trilogy. This is the kind of effects you achieve by creating articulated characters, which are then animated by animators or by electric or electronic systems. Most of the time it’d be a bit of all. The eyes, for example, would often be remote controlled, while arms or body movements would more be rod animated. The rods would then be removed in post-production. After, or along side the Star-Wars movies, Winston has been involved in most of the major hits for about four decades, including Terminator, Aliens, Jurassic Park, Back to the Future and countless others. All those movies have been an essential pillar of my childhood. I grew with these people, and since I felt terribly lonely, they were kind of a remote family to me. A family of peers. I always wanted to create creatures and space crafts or engines like they did. But much deeper I knew from the beginning that I wanted to be in control of the very reason why these characters would exist, and this is probably why I so much wanted to become a director. One could wonder whether there’d still be room for animatronics, nowadays where everything is digital. But make no mistake, create something digitally is always much more expensive and time consuming than anything you could shoot right on the set.